In the grand scheme of things, raising a teenage boy is difficult for parents anywhere in the world. It’s an awkward stage where your child is stuck in a limbo between youth and adulthood; they act like they know everything and yet lack much in experience. Berni Goldblat’s “Wallay” is a coming of age story about a French-Burkinabe teenage boy named Ady (Makan Nathan Diarra), who initially lives with his father in France. Due to Ady’s unruly behaviour, his father decides to send him to a small village in Burkina Faso to live with his Uncle Amadou (Hamadoun Kassogué) in the hope that this experience and drastic change in environment will help him grow up and become a man. The film focuses on the personal nightmare that Ady has to go through, coping with village life in Burkina Faso. It doesn’t need to show us details of his previous life in France for us to understand the massive adjustment. 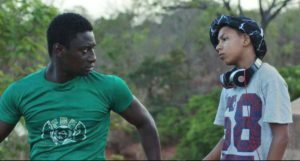 The first scenes in “Wallay” have a lighter tone, Ady is under the assumption that he is in Burkina Faso for a brief holiday and will go back home in a week. He bounces around town showing off his iPhone, Beats by Dre, and French hip hop. Then, it’s revealed he is meant to stay in Burkina Faso permanently — which sparks a great deal of friction between Ady and his Uncle Amadou. The dynamic between those two is intentionally the most interesting and dramatic aspect of the film because Amadou’s plans and interaction with Ady are full of suspense and account for the major twist in the film. The two never see eye to eye on anything and neither is willing to compromise. Uncle Amadou believes the best way for Ady to grow up and become a man is by getting circumcised and, when Ady resists, he is willing to do whatever it takes for his nephew to live by his standards — but Ady won’t go down easy. While watching the film, the audience’s main concern is finding out how those two will eventually come to some sort of resolve. Without giving too much away, this concern is handled in a satisfying scene on a river, the moment when Ady finds out his Uncle is tricking him into getting circumcised. Much of what that happens in “Wallay” is not all that surprising though — Ady faces fairly standard hang-ups. It comes as no surprise that of all the adjustments he accepts, an act like circumcision would be used as the most critical and unacceptable. The film doesn’t make any earthshaking revelations or provide an elaborate display of African cultural initiation. It keeps things simple and maintains its focus on the more personal aspects of life: how Ady makes choices, bonds with his relatives, and even gets into a romance. “Wallay”’s director Berni Goldblat is Swiss, and its writer is Frenchman David Bouchet. For filmmakers with an outward eye looking in, they were able to hit many relatable notes and realistically show Ady’s reaction and transformation in the village. The awkwardness of struggling to communicate with people, that feeling of superiority, the calmness and normal depiction of everyday life in a rather small village are staples of such a drama. However, “Wallay” doesn’t capture the lives of locals or depict the defiance of a system as effectively as Ousmane Sembene’s far tougher “Moolaadé” — which is similarly set in a Burkina Faso village and tells of story of a girl named Collé’ (Fatoumata Coulibaly) who fights against her fellow villagers’ belief in the necessity of female genital mutilation. “Wallay” is not the most compelling film. It doesn’t have anything new to say, but it offers a unique look at an angsty teenager’s engagement with an entirely different lifestyle. The way the lead character makes his way around the village is somewhat endearing at times, and sweet. I would recommend anyone to watch “Wallay” based on that fact alone. Want to learn more about “Wallay”? Check out this episode from our friends at Cinema Red Pill, a Uganda-based podcast about African and other international films. Wallay — Burkina Faso/France. Dialog in French and Dyula. Directed by Berni Goldblat. First released February 2017. Running time 1hr 24min. Starring Makan Nathan Diarra, Ibrahim Koma, and Hamadoun Kassogué.